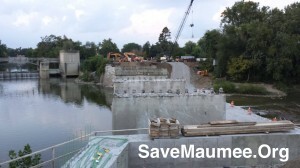 Save Maumee has simply one thing to say about the Fort Wayne River Development plan and creating access points along our local rivers: If it does not improve water quality, or adds more impervious surfaces to further strain our already full storm sewers with run-off, it should not be considered. We understand that improving water quality continues to be the biggest challenge for Fort Wayne’s rivers, as it always has been. River development “is an opportunity that all cities across the county wish they had,” says President Kinder Baumgardner of SWA, the firm contracted to study the rivers at a cost of $500,000. Legacy funding should generate solid, achievable water quality improvement suggestions within the study. A plan could alleviate runoff and surface water contaminants from Fort Wayne, all the way to Toledo, Ohio’s Lake Erie. This plan could not only reduce storm water entering the already full sewers, but could add more vegetation, slowing flood water and creating habitat for wildlife. Fort Wayne does not want to merely showcase our focal point and make the rivers more viewable by removing more trees. We do not want development to have the “appearance” of improvement just so it is easier to look upon a river that continues to be deemed “impaired” by the federal government’s 303(d) list of rivers and streams that do not meet water quality standards in the United States. In the first weekend of January, I was stunned to see throngs of robins clustering in the red fruited flowering crabtrees along Kreager Park’s soccer field parking lot. By Wednesday, they had doubled or tripled in number. They were stripping shriveled berries and seeds from vines and bushes. These opportunistic refugees from the storm front that drove them north will find no such buffet along the riverbanks in the Fort Wayne area due to the Army Corps of Engineers’ thorough removal of plants and trees. Despite local groups’ work to naturalize the riverbanks and levees along the Maumee River, seven years’ work was efficiently erased by Corps of Engineers subcontractors who tore out trees, bushes, shrubs, vines, wildflowers and seedy weeds, leaving only a scruffy shag of burnt-looking and limp grass. This mat of dead grasses will offer returning bird populations nothing but an unobstructed view of rivers that offer neither food nor shelter. Restoring native plants and grasses helps reduce runoff, stabilize soil and reduce pollution. Preventing silty erosion, soil and extra agricultural byproducts from entering our rivers helps improve water quality. Since it began, the Lake Erie Waterkeeper-Save Maumee Chapter has cleaned up 22,000 pounds of trash from rivers, streams and other riparian areas, which include locations on the bank of a waterway, program director Abigail King said. The Save Maumee Grassroots Organization began in 2001 and joined forces with Lake Erie Waterkeeper in March. Lake Erie Waterkeeper is a nonprofit organization that belongs to Waterkeeper Alliance, which is an advocacy organization that aims to protect and preserve the water supply. The group will host several upcoming events to celebrate Earth Day and to aid in improving local river quality. Save Maumee’s seventh annual Earth Day event will take place on Sunday, April 22, at the corner of North Anthony Boulevard and Niagara Drive. The outdoor event is a swift change from most Earth Day celebrations, with tree planting, installing erosion control mats, removing garbage on river banks and rallying for cleaner water. “I have attended many where there are booths inside buildings to celebrate Earth Day and felt a need for something more. People need to embrace the natural spaces that we have and enjoy them, beautify them,” King said. 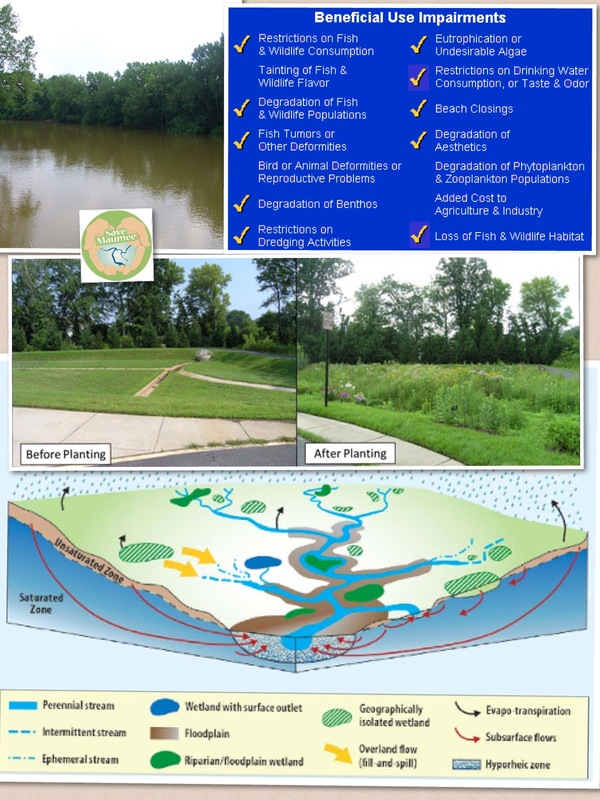 The grassroots organization was formed to create awareness about the conditions of the rivers in Fort Wayne and to also facilitate “ecosystem restorative projects to help Lake Erie,” according to the group’s website. The St. Joe, St. Marys and Maumee rivers are all a part of the organization’s projects. King’s efforts to improve water quality began when she purchased a home near the Maumee River. The work of King and many other volunteers is starting to pay off. Recently, the organization was awarded “Indiana Organization of the Year 2011,” presented at the Butler University Conference and given by the Hoosier Environmental Council. “Our volunteers have set the example of effective ways to help with the No. 1 pollutant in our watershed-sedimentation/erosion-and rallied our local citizens, business and government to action,” King said. The group focuses on the Maumee because it contributes to the Great Lakes and also has local importance. The organization also represented northeast Indiana during meetings on Capitol Hill and has participated in Clean Water Week in Washington, D.C., since 2008, King said. The group will take part in SolFest at Fox Island County Park in May, and it will hold its fifth annual Canoe Cleanup later this year. When it comes to keeping local rivers clean, King offered some advice. She said the group is busy planning, executing and implementing plans to benefit all. On Wednesday, April 18, residents who want to help raise money for Save Maumee can do so by dining out at Texas Roadhouse, 710 W. Washington Center Road, from 4-10 p.m. Ten percent of food sales will be donated to the organization.